Children walk down an alleyway where sewage runs freely in Pikine, Senegal, Oct. 16, 2015. 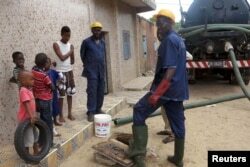 The sulphurous odor wafting from an open septic tank on a sandy street in Dakar may be stomach-churning but Senegal's government believes such pits could contain a solution to the fast-growing capital's sanitation and power woes. The chaotic expansion of the city of 3 million people in recent years has meant many homes in its sprawling suburbs are unconnected to sewage pipes, leaving residents prey to diseases such as cholera, typhoid and hepatitis, particularly during the three-month rainy season. Many homes have no toilet and those that do pipe waste into septic tanks outside, which often flood during the rains. Aging sanitation trucks are too unwieldy to access many narrow alleys, meaning households must clean out tanks by hand or pay someone else to do so. For many residents, mechanized removal of waste, which costs more than double the price of manual emptying, is too expensive in a country where most people scrape by on less than $3 a day. FILE - Sanitation workers removes septic waste from a house in Guediawaye, Senegal, Aug. 19, 2015. Government, charitable organizations are installing new toilets that turn waste into compost or break down matter with worms in bid to lower health risks. In one of the first projects of its kind in Africa, Senegal's government and charitable organizations are installing new toilets that turn waste into compost or break down matter with worms in a bid to lower health risks. For the existing septic tanks, they are providing small portable pumps to allow sanitation teams access to the cramped backstreets to remove waste safely. "If we want to have a healthy and productive society, we need better sanitation for everyone," said Sarah Nehrling, research manager for Innovations for Poverty Action, a partner on the program. Eventually, the project aims to use waste material collected in this way to power an electrical plant — using new technology to find a renewable means of tackling the problem of frequent blackouts in the port city. Nehrling said they hoped residents would one day be paid for waste to fuel the plant. Hadjiratou Ane, a mother of six from Keur Massar on the very edge of Dakar, said the new toilet in her family compound — installed by a local organization working with Oxfam, one of the project partners — had changed her life. Her family previously relied on a hole in the ground and the forest across the street. "The children... no longer need to go to the forests for their needs," said Ane. "The family's health has improved. I am proud to have a toilet." Under the initiative, residents can dial into a call center that gives trucking companies an hour to submit bids to empty tanks, before selecting a winner based on price and proximity. Senegal's national sanitation bureau hopes the project can reduce the households that manually empty their pits and lower sanitation expenses by 45 percent. The goal is to feed households' sludge to a small power plant for conversion into drinking water and grid electricity. A Gates Foundation representative said they hoped the plant would be fully operational in a few months. Initially, it will produce 1,000 megawatt hours of electricity a year — enough for about 5,000 people — but project partners believe it can be scaled up as Dakar grows. The city's population is forecast to rise by half by 2025. Some residents, however, turn up their nose at the idea: "I don't think I could drink water made in that way," said Ane. The effort is one of myriad renewables initiatives intended to tackle Senegal's power deficit. Like most African countries, Senegal suffers from high electricity prices and frequent blackouts. Senegal's power costs are up to five times higher than in other developing areas: $0.22 per kilowatt-hour compared to $0.04 in South Asia, according to the International Renewable Energy Agency (IRENA). Poor energy access has hampered Africa's economic growth and poverty reduction. The International Energy Agency (IEA) says an injection of $450 billion is needed to power every urban area by 2040. While Senegal relies on fossil fuel imports, it hopes to harness renewable energies like solar and wind to produce 15 percent of its energy needs by 2025. Djiby Ndiaye, director of Senegal's national renewable energy agency, said recent low oil prices would not derail the plan: "We have no control over the price. Tomorrow it could rise again.